Importance of Spiritual Practice (Sadhna): God made the Human, to know the realty of life and enjoy the life. Human is also the most creative living thing in this world or universe. Today he is confused, sad and disappoint because of false illusion of desire. God gifted life is not for spending in vain. Human is forgetting his real aim of life behind the money, and other things. But even after finally human himself is not getting satisfy with his acts, this is the sign of lost of peace and life become turbulence. Mean all are sad due to any feeling, diseases, or money etc. But happy is only that person who is busy with his worship or spiritual practice. Meaning of Spiritual Practice or Worshipping: Spiritual Practice means to know the truth of our soul, it not means that we only give time to God then God will happy and provide us happy and peace. Only way of knowing the God is that just knows the realty of spirit. In our religious scriptures, this is clearly mentioning that नर ही नारायण है mean Human is the God himself. Just he needs to know the truth of his soul. i. We do spiritual practice daily but didn’t get the desire result, instead our situation become worst. ii. I have done Chalisa (A Type of Spiritual Practice) multiple times but didn’t get result. iii. What rules should we follow for spiritual meditation practice to get success early? SO Then I replied you need to do all things in schedule and discipline, and then you definitely get good result quickly. Like you go to office or school daily in schedule and discipline. Your all work has been performed in a discipline and scheduled then you got success. i. First of all purity of body is compulsory, means brushing the teeth and taking bath is necessary before starting the spiritual meditation practice. In case of very low temperature, disease or cold just wash face, legs and hands with hot water. But this option is only for emergence not for all. ii. Clothes should be fresh and minimum on body. In winter season warm clothes are required. iii. Spiritual Meditation practice place should be peaceful, fearless and positive. i.e. bank or river, cow shelter, temple, cave etc. iv. 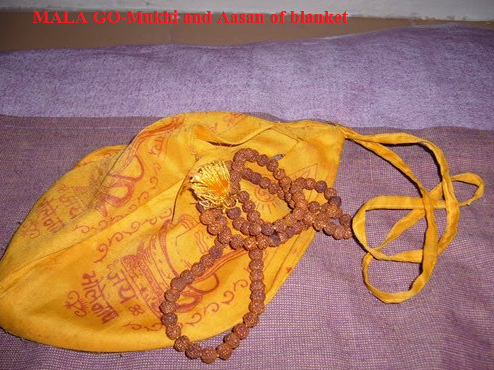 Aasan : All type of spiritual meditation practice is required personal Aasan(A peace of warm clothe or blanket which are used to sit during practice). Color of Aasan should be White or Red, Asan should be personal and should not used in another task. v. Aasan should be made of wool, Kusha or lion’s skin, this type of Aasan protects the positive energy into our body, which help to improve in spiritualilty. vi. Body situation should be fix, during Sadhna body movement should stop, no activity should be in body. Spinal Cord should be straight. It is very useful to improve in Spiritual meditation practice. vii. Selection of Mala(Rosary), For Prema Bhakti practice we can use Tuli Mala, For any mean we can use sandal wood mala, Rudraksh Mala, Turmerc Mala etc. viii. Bet time of Spiritual Meditation Practice is 4 A.M. to 5 A.M. If due to any reason it is not possible then it should be done in Gau dholi bela, the time of sun rise and sun set. ix. Sadhak should do his practice at same place and chanting the fixed number of mala daily. He should chant the mala in Gomukhi, Because mala should not visible to any other during rotating. Sadhak should not cross the Sumeru (the start point of rosary), he should revert the mala from end/start point of mala. Sadhak should chant the mantra in heart, lip should not move during chanting the mantra. x. Sadhak should beware of any type of excuse. Like we take food daily similarly spiritual practice is the food for soul or spirit. NOTE: Female Sadhak should stop chanting mantras while their MC, They should start their Mantra practice after the 4 or 5 days as requiired. Sadhak should not use Non-Veg and Drink During their spiritual practice. All possible rules are provided here even now if someone have any doubt or need more information, then please feel free to contact me. delighted to read the content. and downs the whole life. in stride without complaint and regrets. wisdom gyan, what to do, and how to do. want to know how to do all that. Chant 'ॐ शिव गुरु गोरक्ष नाथाय नमह:' in morning before sunrise with Tratak meditation of ghee lamp. Make this as your habit and changes will start in your life. Thank you so much for your reply and guidance. I don't understand hindi, so if possible can you please give the mantra in english. Furthermore, how many times should I chant this mantra before sunrise and what's the tatrak meditation of ghee lamp. Where do I get the detailed procedure for the Gugle dhooni process. Can you also tell me, what exactly are these balls of energy which I feel in my back and why no one with psychic abilities are able to see it. Gazing the light of lamp is called Tratak. In my current situation I won't be able to afford these ebooks, so can you please tell me how to do the Gugle dhooni process. One more thing, for how long should I do these process. I'm Nadmin Ali, born and live in the Rep of Mauritius (DOB: 11 Dec 1978) and permanently I feel few balls like energy in my back along my spine and which sometimes become very painful (sometime this energy makes me feel extreme rage for no reason and sometimes makes me feel restless). It all started in the year 1998 when an energy woke me up one morning (around 4 to 5.00 in the morning). For about 10 sec, this energy tried to get inside my back (below my neck at the back to be more precise) and eventually got inside. Since that day my life turned upside down. Until today my life has remained stagnant (no progress at all) and I feel like a constant obstacle around me (I have noticed that when I chant a new negative energy removal mantra I will observe clearance of the obstacles for few days and then it will feel like the mantra has no more effects) . What's weird is that, I have seen many people with psychic abilities and they all said there's nothing. But I know it's there though I have no idea why it can't be seen. Principles, Rules and Benefits of Spiritual Practice. Can you please tell me what are these balls which I feel, are these balls related to the contact obstacles and how to remove it using a mantra. Thanking you in advance and hope you can help me. In my previous email, I forgot to mention that when I do intense meditation fragments of this energy will come to the surface and then for sometime I will feel like something is crawling on my skin and then it will disappear. is their any Shabar mantra for self-purification (body,chakra ..etc ). Like Shudhikaran mantra before commencing mantra sadhana. jai guru dev, mujhe kundalini chakra jagrit karke supreme power pe jana hye to mye kiya karna hoga, mye gharme yog practice karta hoo avi tak no improvement, help me. I was in relationships for about four years but don't know she changed suddenly few people's interfered In my life and now we are not together once upon a time she was ready to die for me but now she don't even cares.Many of them are distracting her from my love and I want to marry her can you please help me with this..